1Sources  and  appear to conflict as to whether this company was commanded by Sugar Jones or William Eaton. Worth S. Ray’s book says the former, while Murtie June Clark’s lists the latter. Interestingly, Ray’s transcription indicates that Eaton commanded a Regiment composed of eight companies: Glover’s, Jeffries’, Coleman’s, Harris’s, Sallie’s, Simms’, Hampton’s and Sugar Jones’s. 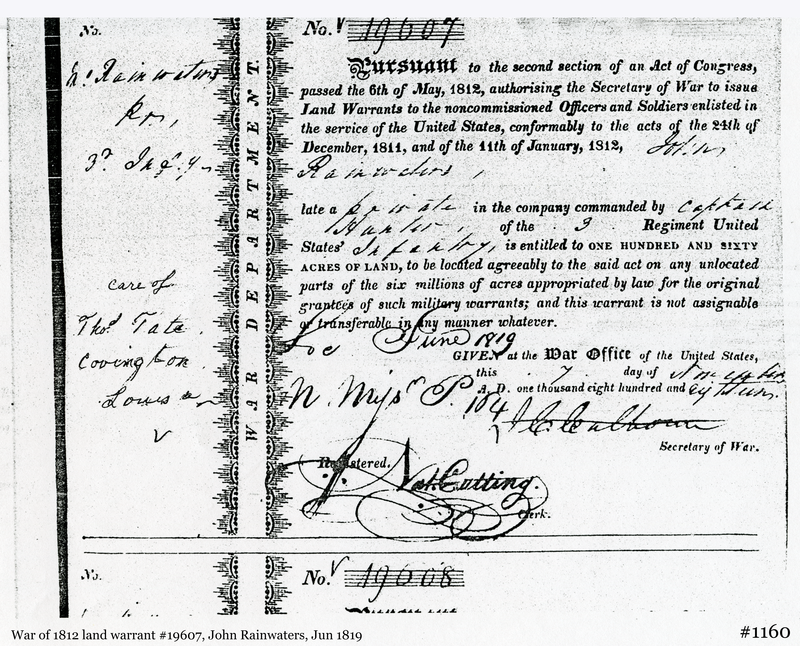 Thanks to Glidie Rainwater Mobley for copies of the service and pension papers of John Rainwater. 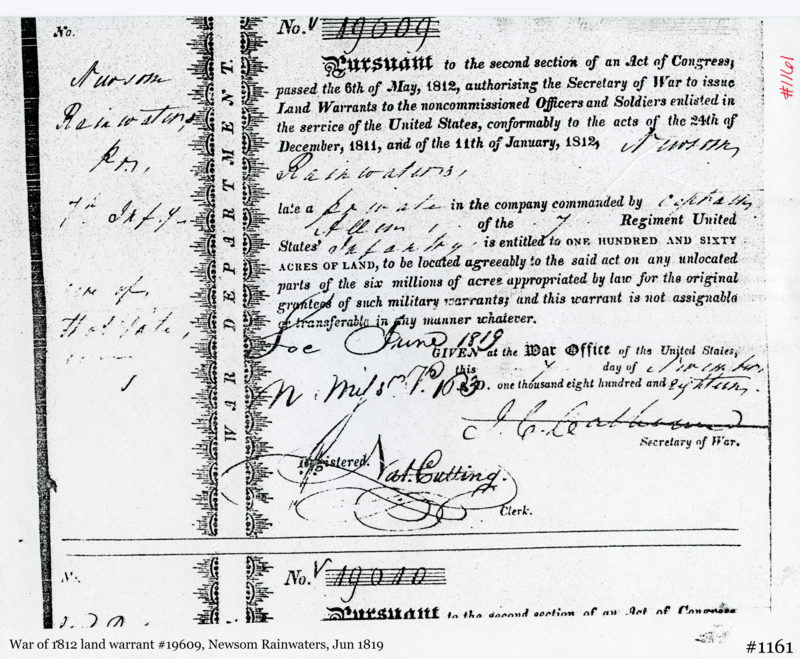 These four individuals are listed as having served in the War of 1812 from Kentucky in Roster of the Volunteer Officers & Soldiers from Kentucky in the War of 1812-1815, Adjutant General’s Office . However nothing in their service records or bounty land papers indicate that any of them were from Kentucky or later settled in Kentucky. Neither did the US 7th Infantry ever serve in Kentucky during the dates of their enlistment. It appears that they would more appropriately be listed as having served from North Carolina. This is not a complete list of all Rainwaters who registered for the draft, but only those where the transcribed indexes are available online. World War I-era selective service registration cards can be requested from the National Archives Regional Center at East Point, GA. These registrations cards include name, home address, age, place of birth, race, citizenship status, occupation, name of nearest relation, and a brief physical description of the registrant. 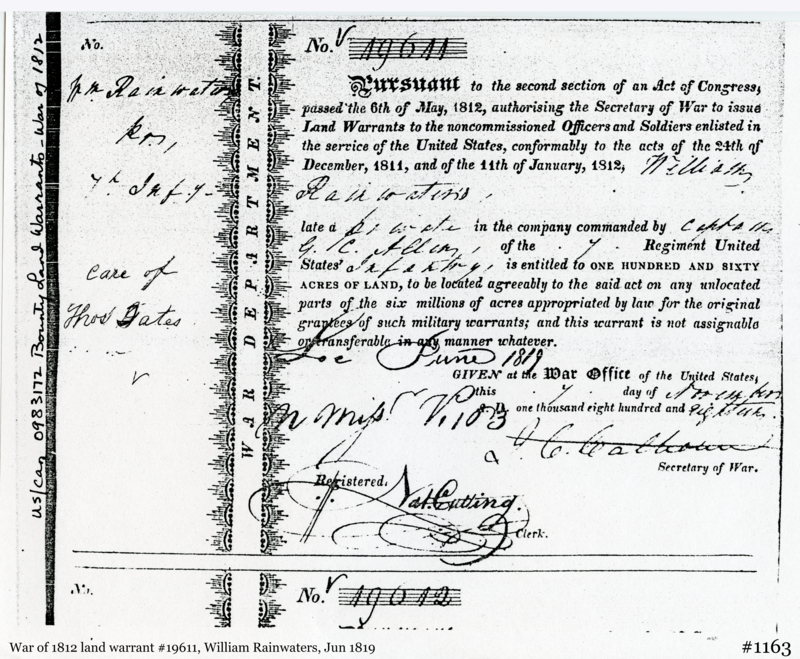 These can be very useful documents for individuals born at a time when birth certificates were still fairly rare. Son of Lila Price & Dennis Dalton Rainwater, Sr. Some of these individuals are listed in National Veterans Cemeteries, but the information supplied does not clarify in which war they served. In other cases, there is no clear category in which to list them. 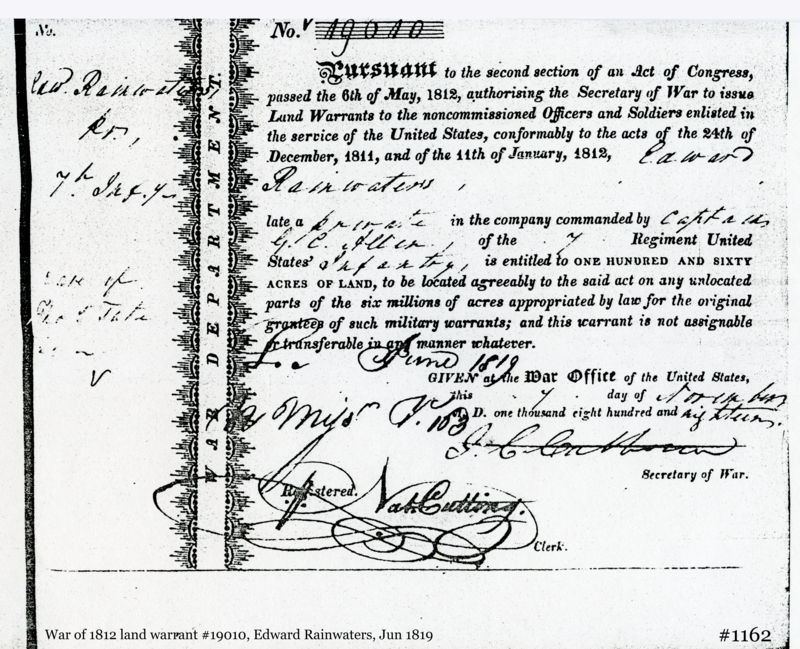 1147: World War I Selective Service Index, USGenWeb transcriptions and Ancestry.com scans of original microfilm. Original data: United States, Selective Service System. 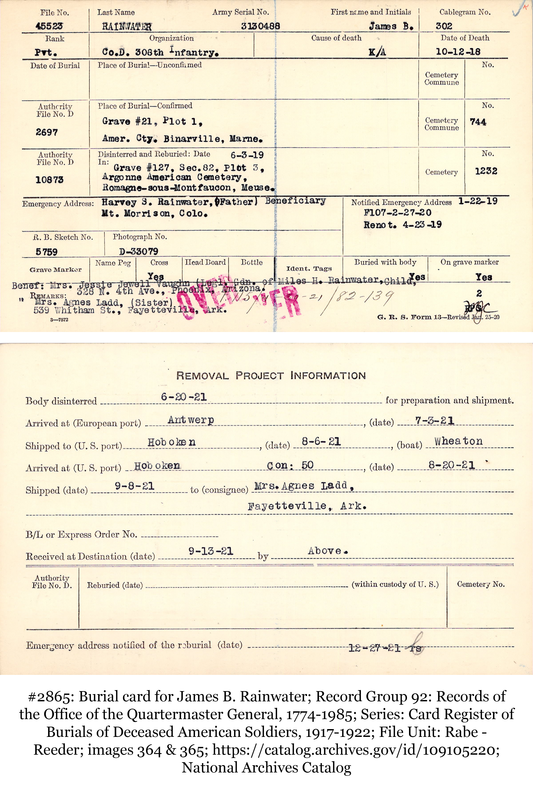 Draft Registration Cards, 1917-1918. Washington, D.C.: National Archives and Records Administration, 1987-1988. Microfilm Publications: M1509. 2312: Find a Grave, http://findagrave.com/, information from this source is uneven and requires 2nd confirmation.